Two years ago, the Nigerian Army compulsorily retired 38 officers, many of them the country’s brightest in internal and external security operations. Ironically, they were forced out of service without recourse to the rules of disengagement in the Nigerian military. Most of the affected officers were neither queried nor indicted by any panel, but got flushed out for reasons that smack of high-level arbitrariness and witch-hunting by authorities of the army, a reason the victimised officers petitioned President Muhammadu Buhari in keeping with the military’s rules to seek redress. But even after repeatedly petitioning the president, two years after, their fates still hang in the balance. Mr Buhari has refused to respond to their petitions, which suggests the president was complicit in the illegality that defined the dismissal of the officers. Military sources have told PREMIUM TIMES the officers were dismissed for either not helping the All Progressives Congress (APC) win some states or not preventing the Peoples Democratic Party (PDP) from winning others in the 2015 general elections. Emphasising “service exigencies” and that the “military must remain apolitical and professional at all times,” Army spokesperson, Sani Usman, on June 10, released a statement, disclosing what could have constituted the “serious offences” which warranted the 38 officers to be compulsorily retired. “Not too long ago some officers were investigated for being partisan during the 2015 general elections,” the statement said. “Similarly, the investigation by the Presidential Committee investigating Defence Contracts revealed a lot. Some officers have already been arraigned in court by the Economic and Financial Crimes Commission (EFCC),” Mr Usman said. However, contrary to the claim by the Army, investigations showed that only a few of the affected officers were queried, tried and indicted. Others had their careers cut short without any trial, indictment or warnings. 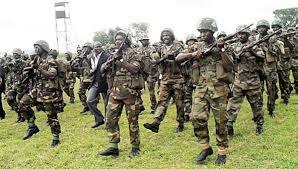 PREMIUM TIMES findings showed that nine major generals, 11 brigadier generals, seven colonels and 11 lieutenant colonels, 38 officers in sum, were laid off by the army in that mass sack. Although S.D. Aliyu (N/7711); M.Y. Aliyu (N/8114) a former GOC 7 Division; and Fatai Alli, (N/7914) a former Director of Operations in the Army, also faced the presidential arms panel, they were cleared. Yet they were laid off for “serious offence”, investigations revealed. Five major generals – L. Wiwa (N/7665), who is late Ken Saro-Wiwa’s brother; I.N. Ijeoma (N/8304); T.C Ude (N/7866); L.C. Ilo (N/8320); and O. Ejemai (N/8340) were neither queried nor indicted by any panel. The cases of the affected brigadier generals are not different; only one of them – A.I Onibasa (N/9072) – was indicted by the presidential panel on arms procurement. Sources told PREMIUM TIMES that 10 officers were simply retired because they were suspected to have failed to help the Buhari administration regime to power. For instance, two officers were laid off because of their ties to the embattled former National Security Adviser, Sambo Dasuki, sources said. For his alleged close ties to a former Army Chief, Kenneth Minimah, D. Abdulsalam (N/9169) was sent away, PREMIUM TIMES learnt. Koko Essien (N/8794), a former Brigade Commander, 2 Brigade, Port Harcourt, faced the election panel but was cleared. Mr Essien was laid off nonetheless, like Bright Fibioinumana (N/8399); L.N. Bello (N/8799), former Brigade Commander, 34 Brigade Owerri; and M.G. Alli Moundhey, former Director, Campaign Planning in the North-east Operations, who were even not queried in the first place. Although the Nigerian Army said the affected officers were retired for either being involved in the 2015 general elections or arms procurement fraud, investigations showed that officers who were not in Nigeria at the time of the elections were also sacked. According to a document seen by this newspaper, they were retired for allegedly committing “serious offence”. But they were never informed of these offences nor were they invited to face any panel of inquiry, army insiders say. Many colonels and lieutenant colonels who were laid off on June 9 were merely suspected of failing to cooperate with the APC to garner votes in the 2015 elections, sources told PREMIUM TIMES. In one instance, T.A Williams (N/11469) a major; and A. Mohammed (N/10659), a lieutenant colonel, both attached to the 195 Battalion, Agenebode, Edo State, with the latter as Commanding Officer, were said to have been flushed out because of complaint of “not cooperating with the APC, brought against them”. But Mr. Mohammed was said to be away in the North-east at the time and played no role during the election. Yet, he was retired. Findings revealed that these officers, accused of partisanship, were not queried or investigated before they were forced to leave the army. In one curious case, documents seen by this newspaper revealed that A. Mohammed, a lieutenant colonel. was in the North-east involved in the fight against Boko Haram, not Agenebode, but somehow his name was among those listed for alleged partisanship. Seven colonels on the list of the compulsory retirees had no formal charge issued against them nor did they face any panel before they were laid off. For instance, O.U. Nwankwo (N/9678) was studying at the University of Ibadan while M.A. Suleiman (N/10030) was in Chad as Defence Attaché before they were suddenly retired. Then, C.K. Ukoha (N/10319) was in Abuja during the elections, insiders said, but was accused of taking part in electoral fraud in Benin and then retired. The Harmonised Terms and Conditions of Service for Officers whose paragraph 09.02c (4) was relied upon to remove the officers, originates from the Armed Forces Act. In fact, the Army Council, in Section 11(a-f) of the Act, has no power to retire any officer on disciplinary ground without compliance with the steps prescribed by law including setting up a panel to try the accused officials. Paragraph 09.02(e) of the Harmonised Terms and Conditions of Service for Officers, 2012 (revised) – provides that any officer compulsorily retired or dismissed can appeal to the President through the Chief of Defence Staff within 30 days. Our investigation revealed that 22 of the affected officers exploited this window, and had their petitions conveyed to the President by the Chief of Defence Staff, Gabriel Olonisakin, via a July 2016 letter referenced CDS/6/1/A. It was in that CDS’ covering letter, seen by PREMIUM TIMES, that the military first stated specific reasons for which the officers were compulsorily retired – though most of them were never probed or indicted for the purported “offences”. The reasons ranged from alleged money laundering and arms procurement scam to illegal sale of military vehicles and “professional misconduct in election matters”. Nevertheless, none of the officers has received any response from the president – after repeated petitions. “I don’t have information about that,” presidential spokesperson, Femi Adesina, had said last year when approached for comments. The presidency is still keeping mum on reasons for not responding to petitions of the victims. One of the affected officers, Ojebo Baba-Ochankpa, died, while waiting for justice, in January this year. Apart from the military rules, some of the officers, like Abdufatai Mohammed and Nwokoro Ijioma, took the authorities to the National Industrial Court to reverse their dismissals. But nothing has come of their efforts as the army has ignored the court. For instance, in June 2017, the Industrial Court ruled that the Chief of Defense Staff provide evidence that the petitions of the affected officers had been submitted to the president within ten days. But the period which he had for compliance closed without him respecting the court order. The suits by the affected officers at the industrial court are still on even as the army continues to cause delays in the cases by failing to appear in court. Also, late last year, the Senate, following a probe in the development leading to controversial dismissal, asked the Army to reinstate one of the affected officers, Chidi Ukoha. The proceedings of the committee leading to a report were ignored by the invited army chief, Tukur Buratai, drawing the fury of the senators. Presenting the probe report, chairman of the public petitions committee of the Senate, Sam Anyanwu, noted that the officer was wrongfully dismissed despite having up to 12 more years to serve in the Army. “That the statement by the Nigerian Army that the officer as retired on disciplinary ground and given fair hearing before the retirement could not be substantiated by the Army, as the officer was never warned, queried or made to appear before any disciplinary committee / court martial. “That the Nigerian Army could not also prove that the petitioner was in any way involved in arms procurement or in political election corruption,” the report stated. As it ignored the court, the Army also disregarded the Senate. Also, when its representatives attended a Senate probe hearing in October 2017, they were asked what offence was committed by the petitioner, Abdulfatai Mohammed, another affected officer. The Director of Army Legal Services, to whom the question was directed, failed to talk, after practically stuttering for a moment, causing wild laughter to fill the room.